iPIG WiFi Hotspot VPN Security 2.06 free download. Using powerful 256-bit AES encryption technology, the iOpus Private Internet Gateway (iPIG) creates a secure "tunnel" that protects your inbound and outbound communications (Email, Web, IM, VOIP, calls, FTP, etc. Using powerful 256-bit AES encryption technology, the iOpus Private Internet Gateway (iPIG) creates a secure "tunnel" that protects your inbound and outbound communications (Email, Web, IM, VOIP, calls, FTP, etc. 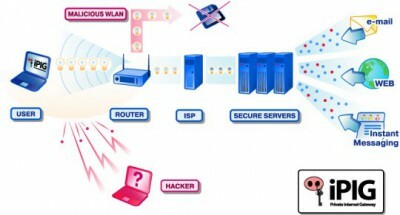 iPIG shields your data from even the most complicated ways of online spying and snooping like the "Evil twin attackts". In addition, your sensitive information is not only protected between your computer and the wireless access point you're using, but all the way to iOpus' secure connection servers deep in the Internet. This ensures that your data can't be easily hijacked through the air and at the point it transitions to a "wired" Ethernet connection. Unlike other technologies, iPig works with any kind of Internet connection (Wifi, WLAN, wired ethernet) and requires NO configuration of any kind. You just start your favorite web browser, email client or chat software and switch the iPig encryption on: iPig grabs all Internet traffic before it leaves your PC and encrypts it securely! iPig also works with all major firewall software like Zonealarm or Norton Internet Security. The software runs on Windows 2, XP and 2003 (Sorry, Windows 98, ME are not supported). ISPs often disconnect their users when there is no activity detected for a certain period of time. Set up a VPN server in less than 1 minute. Stuck behind a firewall? Don't Want To Be Monitored? Use HTTP-Tunnel! HTTP-Tunnel will act as a socks server, allowing you to use your Internet applications safely despite of restrictive firewalls and/or you not be monitored at work, school, goverment and will give you a extra layer of protection against hackers, spyware, ID theft's with our encryption. HTTP-Tunnel NG acts as a socks server, allowing subscribers to use your Internet applications despite of restrictive firewalls anonymously. Kiwi Secure Tunnel is a is a free tool that works as a Secure Tunnel Service for use with Kiwi Syslog Daemon (or compatible syslog daemon).